We help you make it easy & simple. "Kris Miller knows how to engage others in the process of gaining greater financial freedom. I highly recommend her for individuals as well as firms looking to increase their employees' financial health." Kris Miller is a Legacy Wealth Strategist. Her clients learn how to change their families’ financial realities and create incomes they will never outlive. Not one person has lost a single dime on her watch. 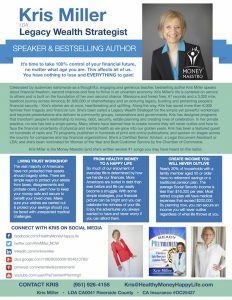 She's an engaging speaker and has spoken extensively on personal finance, retirement & estate planning, living trusts and asset protection at live events and for radio, TV and digital media. 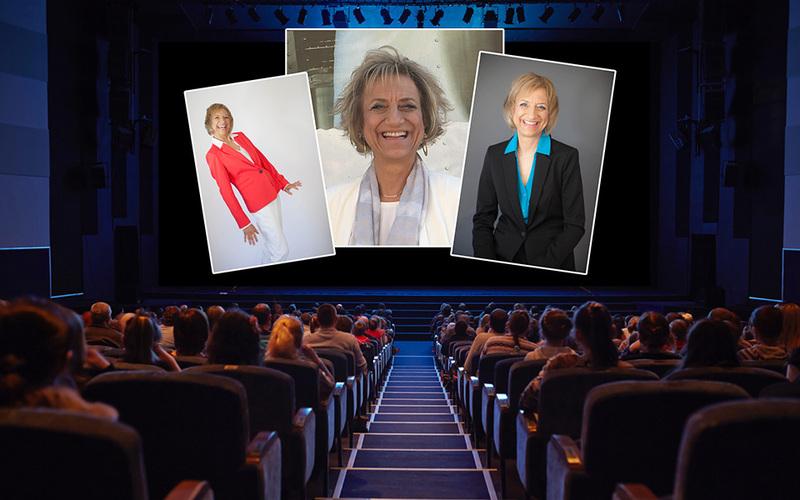 Kris is a highly sought-after speaker & trainer for organizations and businesses including Citibank, Keller Williams Realty, the American Payroll Association and the U.S. Government Financial Officers Association. Ms. Miller is a Legal Document Assistant or LDA among other professional designations. "Ready for PREtirement: 3 Secrets for Safe Money and a Fabulous Future"
Kris Miller is an inspiring speaker, teacher and consultant with over 25 years of experience. Kris has saved over 6,000 families from financial uncertainty. She's worked with many organizations and thousands of individuals showing them how to transform their relationship with money. We all need the knowledge, tips and secrets that Kris generously shares with her audiences. Money is a big part of our lives. Most of us are focused on making more and keeping up with “the Joneses.” What if you could empower your audience to channel their energies and money toward life-affirming experiences? What if instead of adding more things to their “Bucket Lists,” they could transform all those wonderful dreams and turn them into reality? When people hear the right message, at the right time, they can be inspired to reach new levels of financial success and freedom. Imagine win-win results for your audience and team by hiring Kris for your next event, retreat or conference. Kris’s highly interactive presentations go beyond just inspiring your core team or the attendees at your event. Her wisdom will help you be more productive and fulfilled through clarifying your own financial vision, setting specific goals and implementing a plan for attaining them. That's what building Healthy Money and a Happy Life is all about. 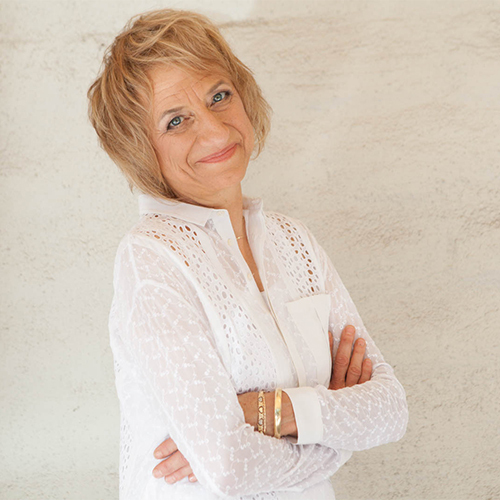 Whether she's leading a small workshop for 20 members of your staff or arousing the collective dreams of 10,000 people in an arena at your next conference, Kris Miller brings an authenticity to the experience. Her wealth building strategies alone can change your audience's lives forever. Kris Miller and Healthy Money Happy Life offer a wide variety of programs for individuals, companies and community organizations. Whether your needs include financial literacy, retirement & estate planning, setting up the necessary legal protections for your family, assets & lifestyle or how to create a plan for financial health - Healthy Money Happy Life has a program to help you. “Kris not only met but exceeded our expectations! Her presentation style was interactive, engaging, and thorough. She was friendly, focused, exceptionally knowledgeable and relaxed. She inspired and motivated conference attendees, many of whom stood in line to receive an autographed copy of her book." 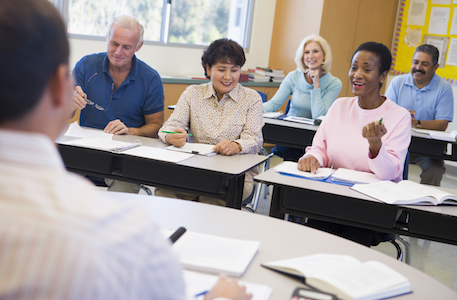 "I attended Kris's seminar about Estate Planning and Living Trusts and was extremely pleased with the simple understandings that Kris shared with me. I took her advise and it’s made a big difference for me. I found Kris honest and trustworthy. I would recommend her for anything you need." On behalf of our National Board and members of Women in Insurance & Financial Services (WIFS), thank you participating in our Educational Webinar Series. Your webinar topic: 3 Secrets for Safe Money and a Fabulous Future offered fundamental information to help our members advance in their careers and develop their businesses. Your expertise, as well as, the time and effort you spent preparing for your webinar was beneficial to our members and truly valued. We know that your time is extremely valuable and we greatly appreciate the role you played in educating our members and fostering important discussion. Thank you again for your participation and support of women in the industry. 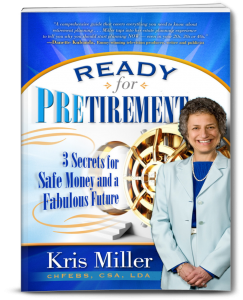 "Kris Miller has the ability to explain planning for retirement in a way we can all understand and prepare." Sign up & receive actionable money tips for healthy money. We’re here to help you in anyway that you need. Get your questions answered. You’re not alone on your journey to Healthy Money. Join others and succeed. Call us anytime. You shouldn’t have to wait when you need help. Sign up for a FREE 30-min. Financial Strategy Session with Kris Miller. Access a range of financial tools to help you succeed with your plan. We respect your privacy and maintain the highest levels of confidentiality. Your success is our priority. We insist that you are completely happy. Does Your RETIREMENT have a SHIELD? The Retirement Shield is a PLAN to maximize your social security income, as well as safeguard your financial nest-egg from taxes, risk and fees.